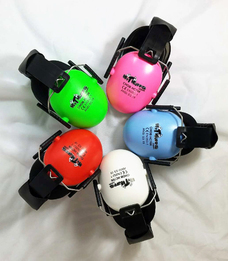 My-T-Muffs™ folding ear muffs for children and babies are the most economical quality hearing protection ear muffs made specifically to fit very young children. My-T-Muffs™ are adjustable to fit babies up to small adults so they will grow with your child for lasting value. My-T-Muffs™ feature a padded headband, soft and comfortable vinyl ear pads, an NRR 19 which is ideal for most situations, providing protection up to 105 dB, while still allowing your child to hear your reassuring voice. The headband folds for easy storage and transport so you can have them when you need them. My-T-Muffs™ Folding Ear Muffs for Babies and Children (NRR 19)5MikeJuly 8, 2015My 3 yr old seems to have sensitive hearing making outings sometimes difficult. With the T-Muffs, she has let her guard down at outings with a comfort level we have never before seen. We love this product and so does our little girl. Thanks! My-T-Muffs™ Folding Ear Muffs for Babies and Children (NRR 19)5gregory b grinsteadJune 28, 2015These work well for babies and young children. Let's protect kids hearing in church. My-T-Muffs™ Folding Ear Muffs for Babies and Children (NRR 19)5Carolyn WhittenburgNovember 13, 2014These are the cutest things ever. My granddaughter is going to the races with us and I ordered these for her. And she is a girly girl and so I picked the pink ones. She absolutely loved them. My-T-Muffs™ Folding Ear Muffs for Babies and Children (NRR 19)5RobertJune 22, 2014These ear muffs work great for my 8 mo. old daughter! My-T-Muffs™ Folding Ear Muffs for Babies and Children (NRR 19)5StacyJune 16, 2014I just received these and have yet to use them. I bought them for my toddler to wear at the dirt track. I was very pleased with the quality and shipping! My-T-Muffs™ Folding Ear Muffs for Babies and Children (NRR 19)5CharleneMarch 10, 2014I bought a pair of these for my 6 year old son as he was having a hard time concentrating in school. He is extremely social and so the noises of his classmates was just too distracting for him and he could not get his school work done. He was really excited to wear them and they block out enough of the distractions that he is able to focus now and he is actually getting his work done. These have been wonderful. My-T-Muffs™ Folding Ear Muffs for Babies and Children (NRR 19)5Courtney WJanuary 22, 2014Wow we went to a NBA Game and these worked so well our 7 week old slept the whole game;) did not have to worry about his soft spot either which was wonderful!!! Thanks for a great product!!!! My-T-Muffs™ Folding Ear Muffs for Babies and Children (NRR 19)5RonJanuary 20, 2014I have 5 grandchildren under the age of 5. I just took them to a monster truck show which is very loud. I am very happy with the product. My-T-Muffs™ Folding Ear Muffs for Babies and Children (NRR 19)4robinJanuary 20, 2014We bought these for our 4 year old boy before taking him to the Monster Truck jam. They fit his little head perfectly and as far as I know, they worked just fine (he didn't complain that anything was too loud the day of the show). We probably won't need them again but having them for the show was a must - worth the $ to save my child's ears! Ordering was easy and they came super fast! Very happy. My-T-Muffs™ Folding Ear Muffs for Babies and Children (NRR 19)5EmilyDecember 14, 2013We bought these because we were taking our 5 month old to the National Finals Rodeo in Las Vegas. They were shipped timely and we recieved them sooner than expected. They worked perfectly. He could still enjoy the show without developing hearing problems. Would recommend to anyone and everyone!! My-T-Muffs™ Folding Ear Muffs for Babies and Children (NRR 19)5DeanOctober 28, 2013Great Product! My-T-Muffs™ Folding Ear Muffs for Babies and Children (NRR 19)5caraSeptember 24, 2013Shipped very fast! Great product at a great price. My-T-Muffs™ Folding Ear Muffs for Babies and Children (NRR 19)5ErinAugust 12, 2013Haven't used the product yet, shipped fast!! Thank you! My-T-Muffs™ Folding Ear Muffs for Babies and Children (NRR 19)5SaraJuly 20, 2013These ear mufflers are awesome! Great quality ! Love em! My-T-Muffs™ Folding Ear Muffs for Babies and Children (NRR 19)5StefanieJuly 14, 2013I bought 3 of these for my daughter and twin boys. They are good quality and were shipped really fast. My-T-Muffs™ Folding Ear Muffs for Babies and Children (NRR 19)5J AkinsJuly 8, 2013Got two of these for my twins. Work great!